Pianos About Town - In A Colorado Minute (Week 185) from Luci Westphal on Vimeo. 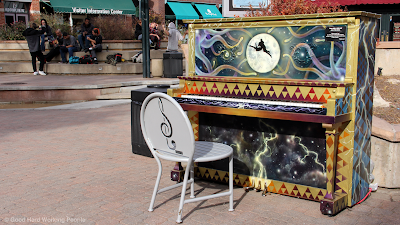 Pianos About Town is a lovely interactive public art installation in Fort Collins, Colorado. Since 2010, painted pianos can be found around the wider Old Town (downtown) area, inviting everyone to sit down and play a little tune. Between May and October, selected artists paint murals on donated pianos outside for the public to watch. In the winter months,most of the instruments disappear into display windows in the Mitchell Block Building (262 East Mountain Avenue) and into a larger storage room. Unfortunately, I missed the window before most of the art pieces went into their winter hibernation. But thanks to Mary Timby and Derf Green of the Bohemian Foundation, I was given special access to film not only inside the display rooms but also the hidden treasure trove of the full collection, usually not visible to the public. Thank you so much again, Mary and Derf. In addition, I was able to track down most of the pianos that will remain outside for the winter. A charming fact is that each instrument comes with a tarp and a sign encouraging the public to cover the pianos at night and during bad weather. My next thank you goes to Jonathan Sadler, who just happened to sit down at the piano outside the Mitchell Building as I was filming inside. He let me record him and use his spontaneous composition for the video. This couldn't have been more fitting because the whole idea of this art installation seems to be the spontaneous playfulness and making surprising connections - and, of course, there's the noise of street life. Thank you, Jonathan! I love the idea of public art, interactive art and bringing music into public places. These are the kinds of things that inspire us to be active, creative, social and to break out of our shell, put a smile on someone's face and maybe even come up with an idea how to brighten another town. In a city where I have not seen a single piece of street art (and if you know me or my videos and photography at all, you must know that I'm having serious withdrawal), it was a real pleasure to discover this project. I think that this takes the cows of New York City and the bears of Berlin to a whole other level. There is another project in town that featured painted electric boxes. I may feature those in a future video. This project functions on several levels: giving old pianos a new life, exposure for artists, the enjoyment and inspiration of art outdoors and, of course, the fun of playing music, listening to music and making a connection with another stranger. My personal favorites are the Victorian lady, the piano of bugs (reminds me of a book I used to hold dear when I lived in Gainesville, Florida) and the one with the dark butterflies in the storage hall (which was recently damaged by an intoxicated and obviously pretty lame guy). But I can tell you already that my favorites are the Victorian lady, the piano of bugs (reminds me of a book I used to hold dear when I lived in Gainesville, Florida) and the one with the dark butterflies in the storage hall (which was recently damaged by an intoxicated and obviously pretty lame guy). 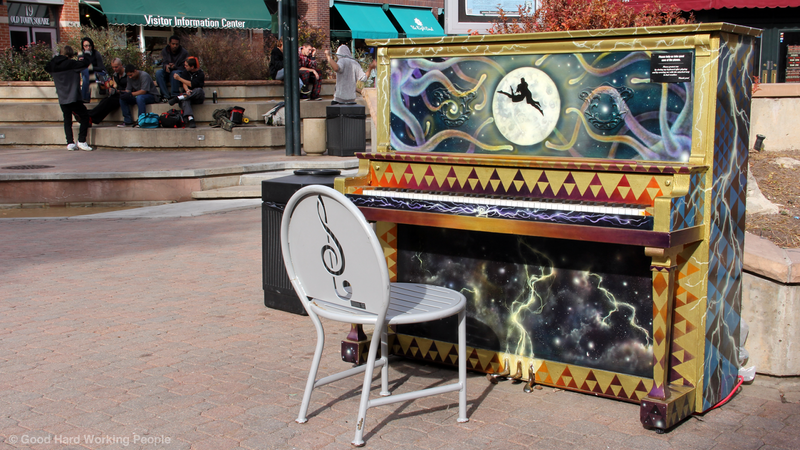 Pianos About Town is a collaboration Bohemian Foundation, the Downtown Development Authority's Art in Action Program, and the City of Fort Collins’ Art in Public Places Program. Well done! A blog post with photos from this shoot will be up on my personal blog in a few days - and I may also publish an extended version of the video in the near future, because there were so many shots I had to cut for the 1-minute version. If you'd like to see and hear more, check out the video about Chris Bates painting one of the pianos while musicians give their own live performance. Lorde - "Buzzcut Season" and "Royals"